Design Fashion,Comfortable Fabric,Strong Loading,Sturdy And Stable,Multiple Uses,Decorative furniture. Design Fashion:Unique Rhinoceros Modeling, A Variety Of Color Options, With Storage function. Comfortable Fabric:Plush Material, Filled With Sponge, Rubber Wooden Stool Feet, Not Only Feel Comfortable, But Also Very Easy To Clean, With A Towel Can Be wiped. Strong loading,Sturdy and stable:Sturdy wooden stool feet, Even force, Strong loading. Light weight,Only take up a small space. 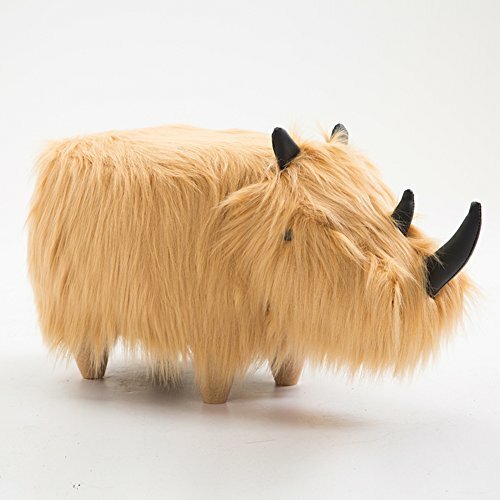 This lovely footstool has multiple functions, Not only as a fun decorative furniture, But also as a kid's and pet's toy. If you have any questions about this product by ✿Dreamer, contact us by completing and submitting the form below. If you are looking for a specif part number, please include it with your message.